Nottingham Trent University city site is located in the heart of Nottingham city centre with 30 buildings surrounded by 5.1 hectares of open space. 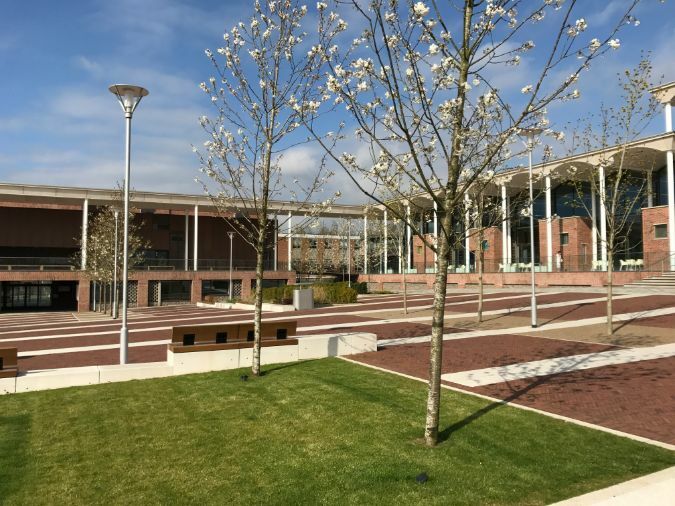 The heart of the campus underwent a multi-million pound refurbishment in 2015 which included two new state-of-the-art buildings in the Clifton complex with beautiful landscaped outdoor spaces where Green-tech supplied the landscaping materials. The landscaping works for this area including the planting of 50 mature trees. Larger, more established trees were specified to maximise aesthetic and biodiversity value. The landscaping contract was awarded to Ulyett Landscapes Limited, a long established landscaping company based in the East Midlands who are well respected for their work with local authorities, architects, civil engineers, builders and private house owners. 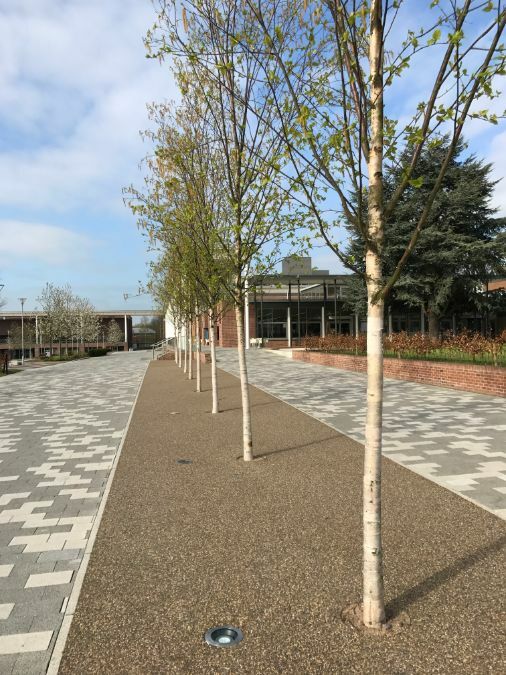 Ulyett Landscapes turned to gt Specifer, the specification team of leading landscape supplier, Green-tech, for our advice on the most suitable products for planting, securing and encouraging the healthy growth of the trees. Taking into account the size of the trees and the environment – the whole site was on an incline; the team recommended the ArborRaft Tree Planting system. This is a system that combines nutrient-rich ArborRaft soil with exceptionally strong geocellular units. Together they create a healthy growing space for trees in urban areas subject to vehicle or pedestrian trafficking. As well as the ArborRaft System the team provided advice and Green-tech supplied an anchoring system for each tree, the mona tree irrigation system, rootbarrier, subsoil, ArborRaft soil and bark for top dressing – everything needed for successful planting under one roof. The ArborRaft system has been used in many high profile projects across the UK with the same success. The individual ArborRaft units lock together and form a raft system that sits within the tree pit, providing load bearing support and reducing soil compaction. As the system retains the open structure of the soil, the roots are allowed to grow naturally and the essential oxygen, nutrients and water can flow freely through the growing media which all ensures the ideal growing environment for trees to successfully establish and flourish.